Arriving in Munich at dinnertime, we met our Airbnb host Lisa at the apartment we were going to rent from her for five days. After a quick tour of the apartment (it was a studio apartment, it didn’t take that long! 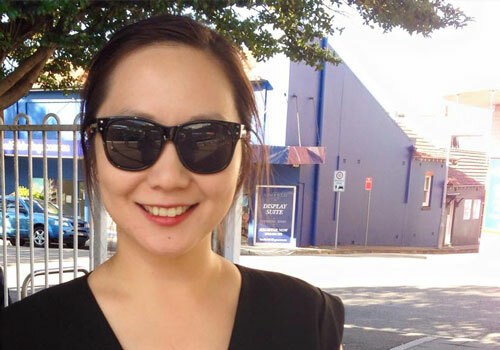 ), she said to us, “Have you got any plans for dinner? I can recommend a great Italian place around the corner. It’s not fancy or too expensive, but it’s not cheap either, it’s kind of mid-range. Just a neighborhood restaurant.” Considering how hungry I was by then, that was good enough for me! With Lisa’s directions, we headed off to Trattoria San Benno, named after the nearby church. Interestingly, Italian seems to be the foreign food of choice in Germany – our Airbnb hosts in both Munich and Berlin suggested Italian restaurants to us. I wonder if it’s because Italian food is generally more universally palatable and is a ‘safe choice’ – most people will enjoy a pizza or a dish of pasta. 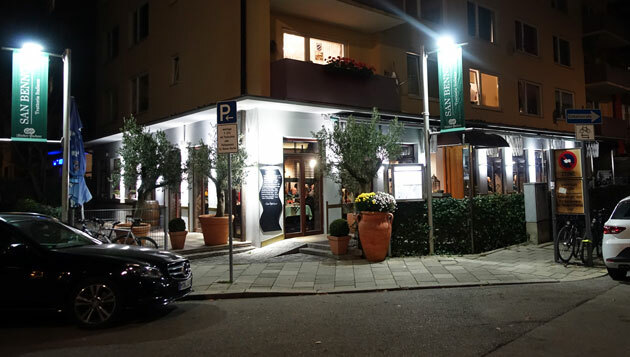 San Benno is very much a neighborhood restaurant – located on a quiet street in the suburb of Maxvorstadt in Munich, there are no other restaurants around. It’s literally the only choice for evening dining in an otherwise residential area, and is very very popular with the locals as a result. It seems genuine as well – the waiters are all Italian, and there’s a large stone pizza oven in the back of the restaurant manned by a pizza chef. We start off as usual with a bottle of sparkling water to share. 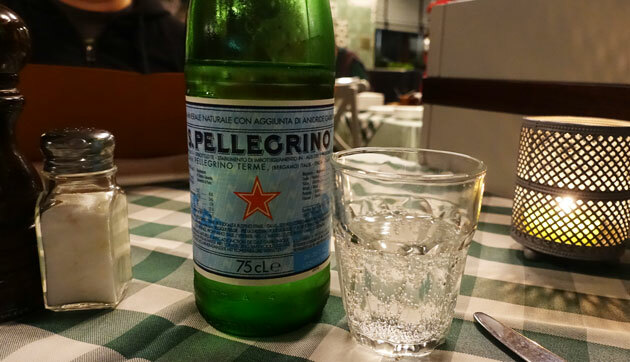 A touch of Italian pride here – where we’d been served the sparkling water brand Romerquelle in most other places in Austria and Germany, San Pellegrino was the brand of choice for San Benno. 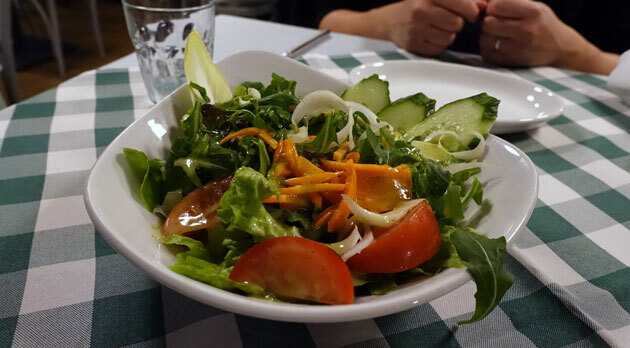 The House Salad to share – unfortunately extremely overdressed, with a pool of dressing at the bottom of the bowl. It was quite a generous serving for its price, but it was let down by the fact that you had to vigorously shake each forkful of salad before you put it in your mouth in order to get rid of the excess dressing. One of the specials of the day was the House-Made Tagliatelle with Lamb Ragout. 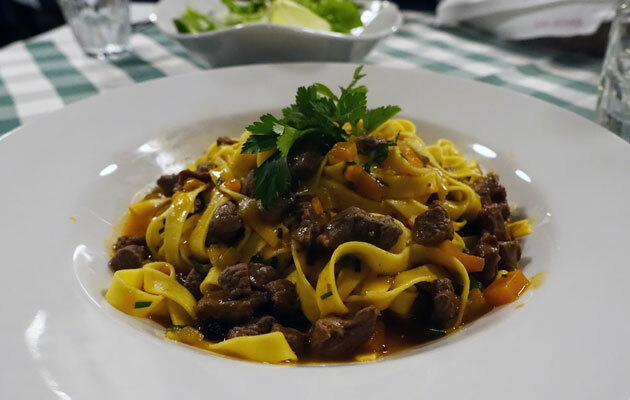 There were lots of pasta dishes on the regular menu, but a rich and hearty lamb ragout sauce was very appealing especially with the slightly cooler temperatures in Germany. The lamb was extremely tender and the sauce particularly rich with a slight tinge of caramelised onion. The pasta itself was beautifully cooked as well with just the slightest al dente bite to it. I thought it was freshly home-made, but K wasn’t quite as sure. Either way, it was still a beautiful dish – simple but rich, hearty, and utterly satisfying. We finished off our meal with a Pizza Capricciosa, with me particularly enjoying my direct view of the pizza chef assembling and then cooking our pizza in the giant pizza oven. The pizza wasn’t cooked quite as well as K would prefer (he likes a lot of charring), but I personally liked the slightly doughier crust. The toppings were simple, and I did like that they didn’t overload the pizza – a mere scattering of olives is generally more than sufficient, you really don’t need four olives on each slice! I thought the ham was particularly tasty as well, and fresh mushrooms are always a treat. 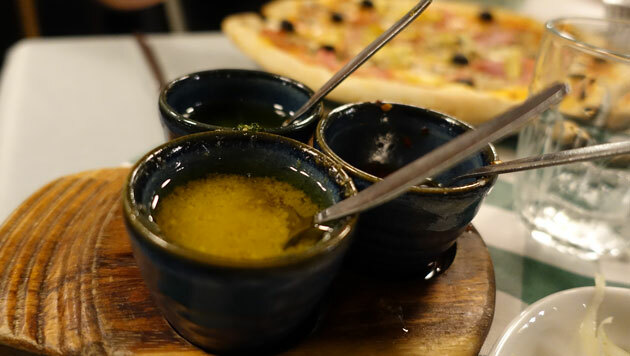 A little trifecta of sauces gets brought out to each table on the off chance that you want to add some extra chilli, garlic or basil seasoning to your pizza or pasta. I tried the chilli sauce on a slice of pizza, and was absolutely blown away by how hot it actually was – definitely not what I was expecting as we hadn’t experienced a truly hot chilli dish in Europe to that point. Trattoria San Benno is a great little neighborhood Italian restaurant – a fantastic choice if you just happen to be staying in that part of Munich. 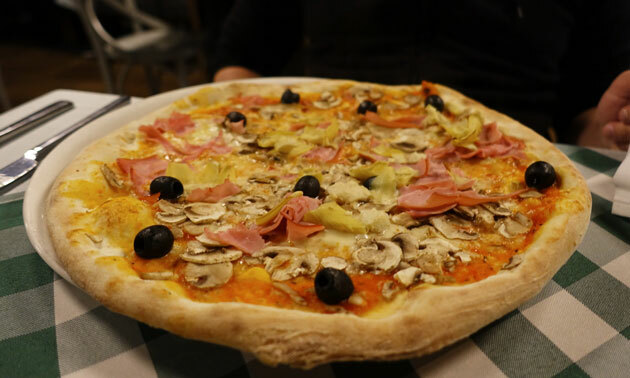 It’s probably not worth the extra trip to get there if you’re staying elsewhere though, as I’m sure there are other similarly tasty neighborhood Italian restaurants almost anywhere else in Munich! Trattoria San Benno is located at 14 Loristraße, Munich.